Here is the quilt that I made from those fabrics. I used the entire collection for the quilt, there were no leftover bits at all. The only thing I added from my stash was the aqua/green border and binding. Did I read that correctly? Your hubby went fabric shopping without you, while he was in London? I am now going to read this blog post to my husband! I love your website – the quilts are fun, Rosie is great and I get a kick out of the extra bits of humor tossed in. I look forward to seeing your posts. I am really impressed with his choice. The fabrics are great. I like the way you have used them in this quilt. The fabric in the border works so well and brings out the colours in the blocks. Your quilt is great! Hi Karen – thank you! I was really surprised at how soft they are. It makes me wonder how old they are – it seems like they had gotten a lot of wear before they were cut up and resold. I would love to work with more of them! Your husband is a keeper! What a nice guy he is!!! Hi Claudia – he is great 🙂 I love your dogs, Tootsie and Willow. I have a labradoodle and a puppy aussiedoodle. 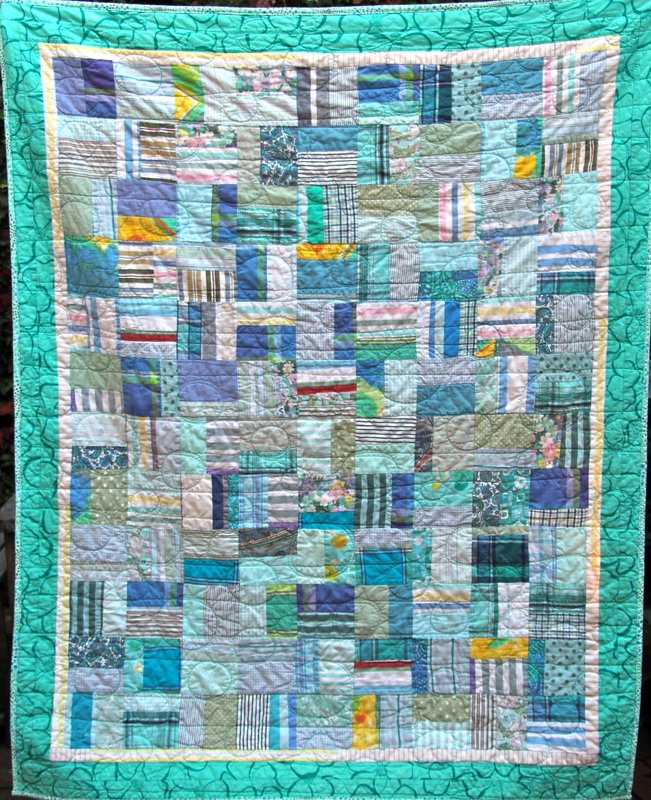 love, love,love the brightness and life you gave this quilt! 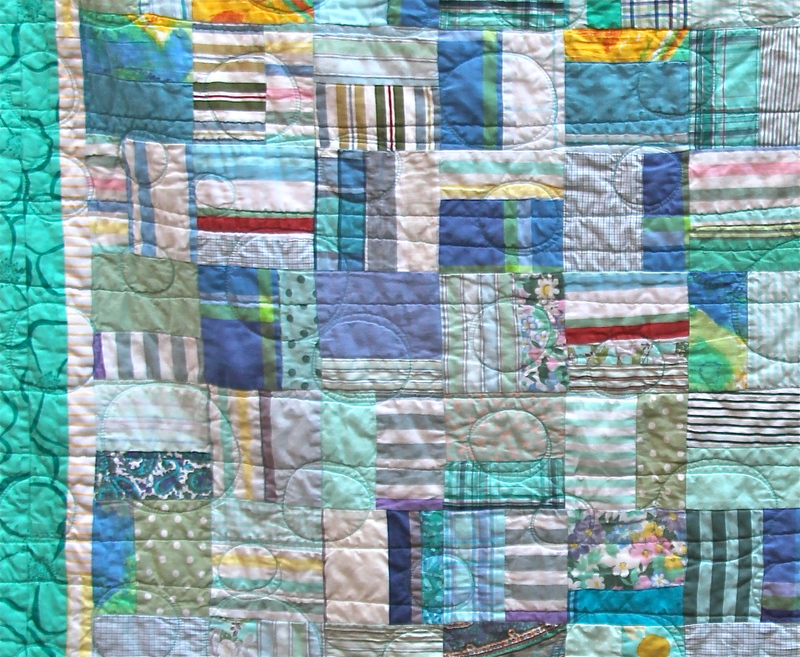 It’s so fun to use repurposed fabrics, it gives so much more meaning to your quilt. Congrats on your finish. Hi – thank you! I would have loved to know the history of those fabrics; I bet it would be interesting! Also, I love the Family Tree Quilt you made with your daughter in-law. It’s beautiful!